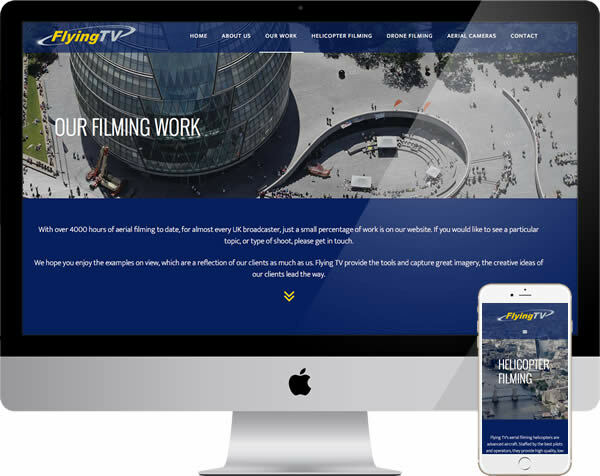 Brief – Flying TV are leaders in the field of helicopter filming and adopt the latest technology. Their website needed replacing to reflect this. The owners wanted a fresh start, a contemporary website, which offered an immediate impact. To suit the creative sector and showcase the fine video, or stills they produced. With a good proportion of aerial filming being a one chance take, they understood the value customers placed on professionalism. Their skilled team and experience required prominence. Technical & Search – An online reference section for archive stills and video needed to be maintained, as a separate entity. A similar main website section required notable change. Although this was technically efficient, users were not accessing Flying TV’s work in any depth and the system caused search issues. The URLs generated bringing duplication, plus a lack of structural clarity. Both issues were resolved, a simpler, easily extendable approach taken to displaying work. Ideal for visitors and with a range of redirects in place, satisfying search engines. Design & Build – Our client supplied an excellent range of high definition, aerial stills, which the design focused around. An example of aerial video chosen to highlight the home page. With the size of the video file and range of images elsewhere, a little extra engineering went into page speed. Options for mobile and lower bandwidth viewing carefully considered. Achieving the right balance of modern design, usability and speed were key to this website. Our client’s vision becoming the route they intended, to please and interest visitors. Outcome – The timing of a national show shortened deadlines, our copywriters working with client management to bring forward completion. The new website well received by users, performance stats improved. Greater clarity also welcomed by search engines. Early days with the site still growing but now ranking well on key terms. A technical and business solution, the emphasis of our development portfolio. By all means read more on this is our introduction to web design. or get in touch if you would like to discuss your own web project.